With a prime location in Central London, The Best Western Victoria Palace is the ideal base from which to explore the city. 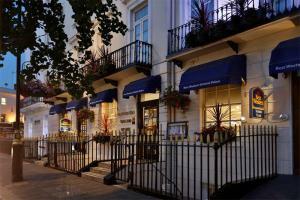 Buckingham Palace, Trafalgar Square, the London Eye and many other attractions are an easy walk from the hotel. A friendly staff and comfortable rooms with modern amenities including free Wi-Fi round out a hospitable stay. The hotel features a main building with elevator access to all floors, and an annex across the street without elevators. Approximately 20 miles from Heathrow Airport. The nearest underground and train station is Victoria, approximately less than a quarter of a mile away.